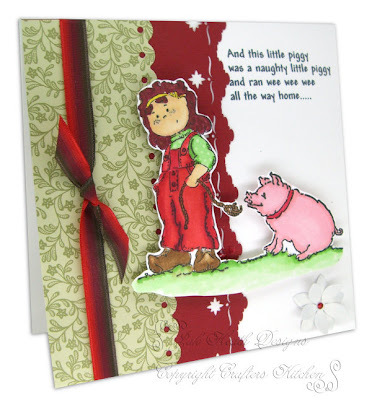 Ollyfants on the farm range stamps coloured with Copic markers, I couldn't resist printing a quote from the This little Piggy nursery rhyme onto the base card I over layered two more papers onto the base card after punching a fancy edge then tying a ribbon around them. Finishing with a white blossom in the corner. Another gorgeous card Jak and adore the colour combination you have used on this one. STUNNING CUTE cards Jak, all are gorjus. Another lovely card Jak, these are great stamps. Oh Jak - your wee Ollyfants cards are just adorable!